SAVING the planet is now a matter of a few clicks—at least on a small scale. On September 22nd the UN’s Climate Change Secretariat launched Climate Neutral Now, a website that estimates an individual’s carbon footprint based on whereabouts, recycling habits, energy use and so on. Offsetting any resulting guilt is easy: the site takes donations to fund clean development projects. Your correspondent paid $24 to a facility capturing methane from pig dung to cover the carbon-dioxide emissions she had caused during the past year. The initiative is one of many intended to spur action on greenhouse-gas emissions in the run-up to climate talks in Paris at the end of the year. Some seem quite successful: in recent weeks around 2,000 individuals and 400 organizations have committed to stop investing in firms that produce fossil fuels. More important, countries have responded to a shift in climate-change policy after the failure of negotiations in Copenhagen in 2009: rather than trying to agree on mandatory emissions reductions, they were asked to say by October 1st what they were willing to do. America’s Clean Power Plan, announced in August, could reduce carbon-dioxide emissions from power stations by 870m tonnes by 2030—a cut of almost a third from 2005 levels and the equivalent of taking 166m cars off the road. China has promised that its emissions will peak in 2030, if not before. And on September 25th Xi Jinping, the country’s president, announced that China would launch a national carbon-trading scheme in 2017 (see article). A few days later Brazil pledged to cut greenhouse-gas emissions by 43% by 2030 compared with levels in 2005. On closer scrutiny, though, some of the pledges look less impressive. America is already most of the way to reaching its new target; China will see carbon emissions fall anyway as its economy continues to shift from manufacturing to services. And when negotiators meet in Paris, they need to keep in mind that the world is already suffering from the effects of global warming. Global carbon emissions were 58% higher in 2012 than they were in 1990. The atmospheric concentration of carbon dioxide has risen from just under 340 parts per million in 1980 to 400 today (see chart). To stand a fair chance of keeping warming to just 2°C by the end of the century—the de-facto goal of global climate policy—the stock of atmospheric carbon dioxide must be kept under 1 trillion tons. Estimates vary but, according to the Intergovernmental Panel on Climate Change, the total had hit 515 billion tons by 2011. Climate Interactive, a research outfit, reckons that if emissions continue on their present course around 140 billion tons of greenhouse gases will be released each year and temperatures could rise by 4.5°C by 2100. And even if countries fully honour their recent pledges, temperatures may still increase by 3.5°C by then. 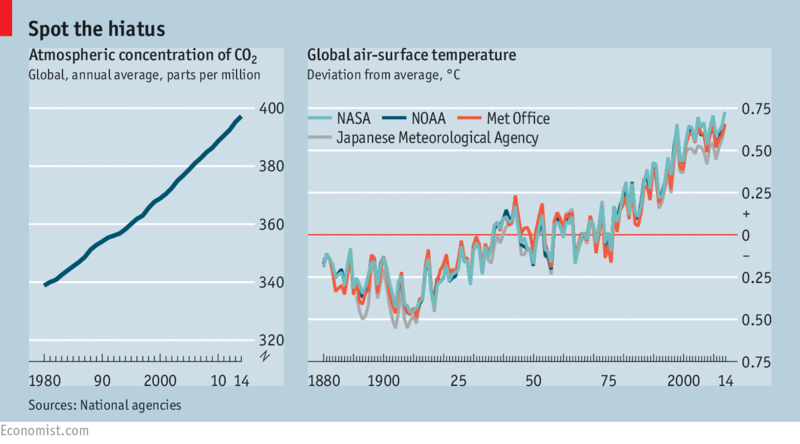 The world is already 0.75°C warmer than before the Industrial Revolution. A recent study published in Science suggests that a much-debated hiatus in global warming between 1998 and 2012 in fact never happened: the cooler readings were caused by a switch to measuring ocean temperatures from buoys rather than ships. Another study, published in Climatic Change, another journal, finds that the statistical tools used to demonstrate the apparent slowdown were not up to the task. And though the science linking weather events to long-term climate change is still tentative, some researchers see the effects of climate change in the fact that July 2015 was the warmest month globally since records began. The year is likely to break records, too. This summer 47,000 people went to hospital after unusually hot days in Japan, and more than 1,000 died in both Pakistan and India during heatwaves. The oceans are absorbing almost all the heat added to the climate system. Summer sea-ice cover in the Arctic has declined more than 40% over the past four decades as a result. 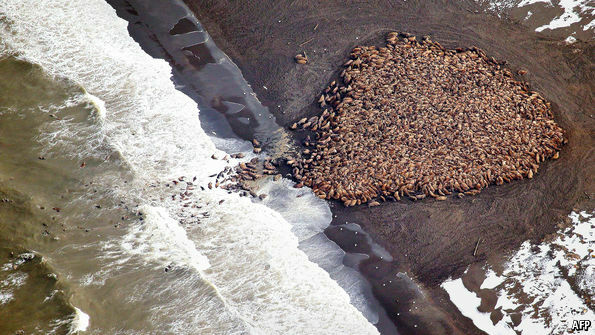 Walruses used to rest and feed on the ice; now they often do so onshore. Over 35,000 gathered recently near Point Lay in Alaska (pictured above). Fresh water is less dense than salt water, meaning that melting ice sheets also disrupt oceanic circulation patterns. The impact on the Atlantic’s meridional overturning circulation, which drives cold saltwater into the deep ocean while drawing warm water northward, may make Europe’s climate cooler. Changing ocean currents also seem to be shifting jet streams and altering storm patterns. Some blame the severity of California’s drought on an unusual ridge of high atmospheric pressure off its coast which appears to block winter storms from reaching the state. For every 0.6°C rise in temperature, the atmosphere’s capacity to hold water grows by 4%, meaning storms will pour forth with greater abandon. The rains of the Indian monsoon could therefore intensify, cutting yields of cereals and pulses. Elsewhere unusual deluges are already disrupting daily life: more than 170 extreme-weather events struck America between 1980 and 2014. Winter storms are more frequent and intense now than at any time in the past six decades. Climate change seems also to be making dry places drier, killing crops and turning forests into kindling. Forest fires in Indonesia, more likely thanks to the current El Niño weather phenomenon, could release 2 billion tonnes of carbon dioxide, about 5% of annual emissions due to human activity, says Simon Lewis of University College London. In recent months fires have swallowed more than 2.4m hectares of American forests. Alaska suffered 80% of the damage—a particular problem because the soot released in these blazes darkens the ice, making it less able to reflect solar radiation away from the Earth. Developments in the Arctic are worrying for other reasons, too. The region is warming twice as fast as the rest of the world, a trend that could start a vicious cycle. Around 1,700 gigatons of carbon are held in permafrost soils as frozen organic matter. If they thaw, vast amounts of methane, which is 25 times more powerful as a global-warming gas than carbon dioxide when measured over a century, will be released. One hypothesis suggests that self-reinforcing feedback between permafrost emissions and Arctic warming caused disaster before: 55m years ago temperatures jumped by 5°C in a few thousand years. In a recent paper in Nature Climate Change researchers from Cambridge University and the University of Colorado use standard environmental models to estimate the economic impact of carbon dioxide and methane being released from permafrost. By 2200, when these emissions are expected to peak, the cost could be 0.7% of global GDP—albeit with a very high level of uncertainty. And on September 29th Mark Carney, the governor of the Bank of England, warned that though measures to avoid catastrophic climate change are essential, not least for long-term financial stability, in the shorter term they could cause investors huge losses by making reserves of oil, coal and gas “literally unburnable”.